Born: March 20, 1865 in Sandwich Ma. 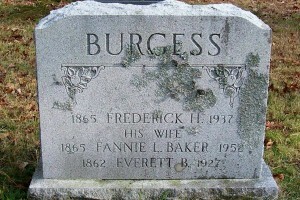 Died: January 15, 1937 in Bourne Ma. at 71 yrs, 9 mos. To: Frances/Fannie L. (Baker) Avery; (1865 – 1952) (Lewis Almon Baker & Emily W. Mecarta); Frances/Fannie married (1) Walter S. Avery (1857 – 1883) (John Avery & Levina Taylor) in Sandwich Ma. on February 27, 1881. 1. Sheldon Seymour Burgess; (August 10, 1887 – May 1966); Married Selina Torr West (1893 – 1995) (William West & Lizzie Turner (West) Clark) in Holbrook Ma. on August 3, 1914; Sheldon died in Brockton Ma..
2. Walter Everett Burgess; (1890 – 1952); Married Celia Shiverick Robbins (1890 – 1987) (Battalma G. Robbins & Mary Brooks Enos) in Wareham Ma. on October 26, 1910; They had 2 daughters. 3. Leonard Latter Burgess, WW l; (March 28, 1897 – September 27, 1953); Married (1) Kathryn Josephine Wallace (1895 – 1974) (Thomas Wallace & Mary Ann (–)) in Buzzards Bay Ma. on August 22, 1921; Leonard married (2) Helen Fay Cable (1906 – 1987) (George Washington Cable & Laura Jane Day); Leonard & Helen are buried in Wesley Chapel Cemetery in Hilliard Ohio. 4. 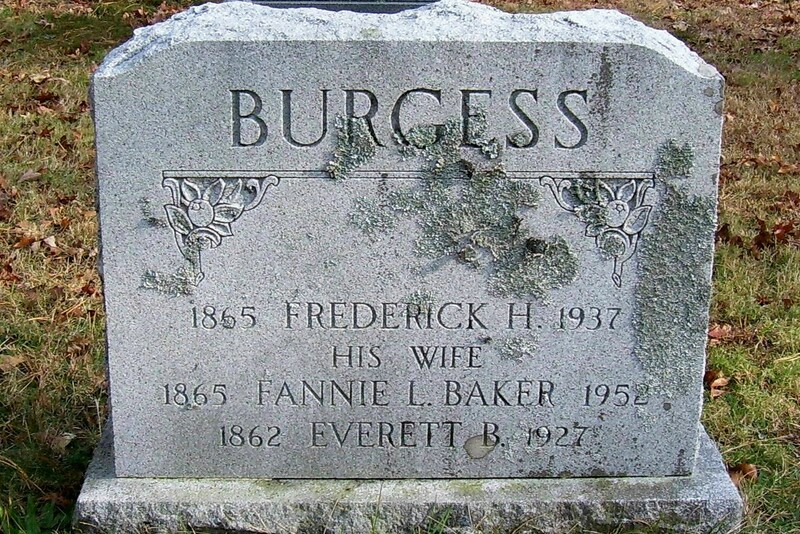 Emily Woodward Burgess Butler Angus; (December 16, 1898 – May 14, 1974); Married (1) William C. Butler (1890 – 1971) (William F. Butler & Arvilla Winifred Carpenter) in Pocasset Ma. on September 19, 1914; Emily married (2) Andrew Harold Angus (1893 – 1964) (John Avard Angus & Lillian/Lillie F. Braley) in Bourne Ma. on August 1, 1920; Andrew married (1) Hazel Bernadine Briggs (1895 – ?) (Charles H. Briggs & Ruth R. Johnson) in Wareham Ma. on August 7, 1915.